One of the greater joys of modern inventions must be the car. The liberty of moving between places, the flowing forward and the arriving. Feel this thrill as you turn your key in the ignition and the surge of excitement connects to the steering wheel. Maybe not though, as we are numbed with complacency and usually drive without acknowledging the pure joyous freedom of it all..
Driving opens up our worlds so much that maybe we should be hugging our windscreens every day in thanks. Or kissing that bonnet! Joy does bounce within us though when we are driving for the pure pleasure of a holiday. A road trip with the sole purpose of visiting amazing places. Roads without swimming pooled potholes and tightroped clifftop curves but with interesting side roads beckoning adventure, coupled with magnificent scenery? Scotland, of course, it has to be Scotland by car. Time to embrace the windscreen and pucker up to the bonnet ! This is a country that combines clear aired spaces with the solidity and awesomeness of it’s moored mountains. The Scottish Islands are places apart, mostly untethered from mainland botherations. The remote unspoilt wilderness of Caithness, Sutherland and Ross-shire in the far northern reaches. Place names with music flowing around and through them – Cape Wrath, the Summer Isles, Auchtermuchty, the Sound of Arisaig, Drumnadrochit, Altnahara, Rannoch Moor, Scapa Flow. 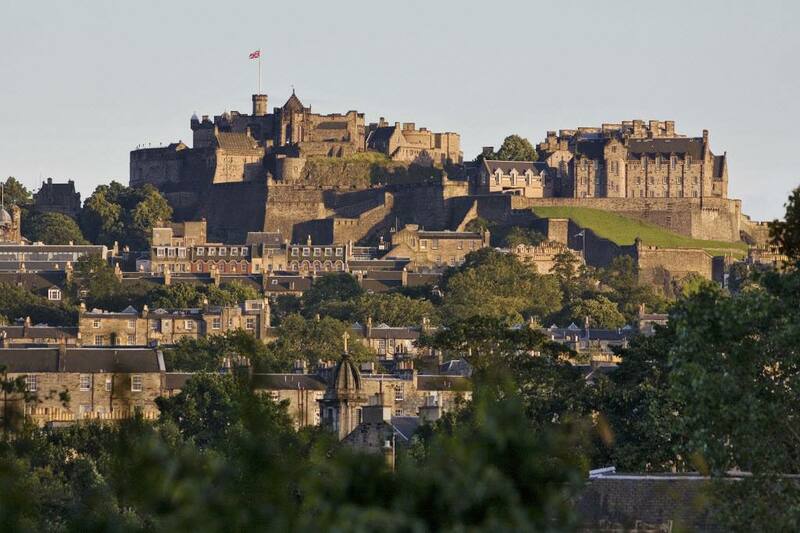 Edinburgh , begin here at this exquisite capital city. You might need to pick up your car here or, alternatively be picked up if you choose a chauffeur driver/guide option. Whether you arrange your transport here or not, this city is a compulsory place to visit in Scotland by car. It is an essential part of your road trip. The Castle, the Ghost tours, Mary Kings Close, the Palace of Holyroodhouse, visit and experience these of course but perhaps the real heart of Edinburgh beats in the memory of a dog ! Greyfriars Bobby was a Skye terrier who pined at his owner’s graveside and refused to leave. The cemetery keeper tried often to evict Bobby and failed, eventually making a bed for him beside the grave. The locals also looked after their adopted dog. When the daily one o’ clock gunshot clapped from the castle he would leave the cemetery to eat a meal provided for him in the nearby coffee house. Crowds often gathered at the kirkyard gates to witness this extraordinary punctuality. Bobby guarded the grave for 14 years until his own death. In 1873 a sculpture was erected to this beloved marvel beside Greyfriars Kirkyard where he is also buried. Naturally his grave is flower strewn. His headstone reads “Greyfriars Bobby – died 14th January 1872 – aged 16 years – Let his loyalty and devotion be a lesson to us all”. Indeed, let it be so. Park the car and explore this unique city by foot as it’s history seeps out of the darkened Gothic buildings and underneath bridges and through winding narrow lanes. It is a 19th century Batman’s Gotham, reeking in it’s individuality. Proudly faithful to it’s history and unafraid to claim the darker , foulest of deeds. Murders, bodysnatching, witch persecution, the terror of torture all steeped in abject poverty. In fact Edinburgh embraces the murky past, loyal and devoted to it’s history. Echoes of the steadfast Skye terrier, Bobby, are imbued in this enigmatic city. Once your feet have surrendered and returned to the car it’s time to drive 10 miles outside the city to Dalhousie Castle. This is an amazing place to experience the thrills and ancient art of falconry. There is an impressive variety of birds of prey here including owls, falcons, buzzards and eagles. Receive guided tuition in handling your bird before it soars upwards and returns spectacularly to your hand. I’ll cut a swordblade on the wind” (Jonathan Steffan). The surge of excitement is still with you frizzling the air in your car as you drive on to another amazing place. 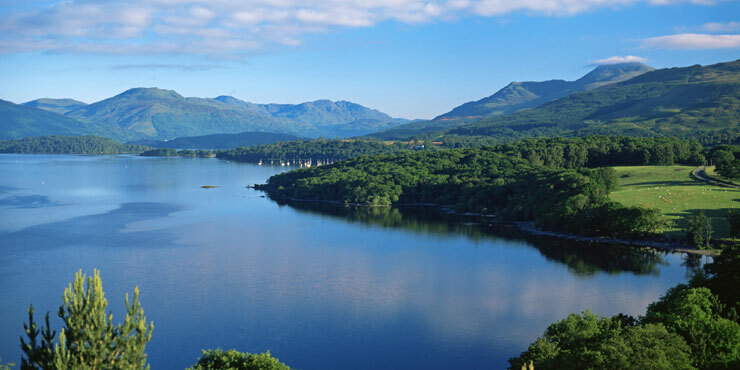 Take the A82 northwards along the gentle shores of Loch Lomond towards Crianlarich. This is Scotland’s largest lake “Where in purple hue, the hieland hills we view, And the moon coming out in the gloaming.” – Naturally you will want to hum the lines of one of Scotland’s most iconic tunes dedicated to these shores. Doubly Bonnie it surely is. This lake is easily accessible and you can swap the steering wheel for the helm with boat hire available in Luss. Or sit back and take a boat tour of this iconic lake as you explore it’s open charms from Balloch, Luss or Tarbert which are all along your route. Enjoy the soothing lap of the waves before you drive on further northwards to one of the most amazing places to visit in Scotland by car. No, wait, truth first and speak from the heart – it is the most amazing. Glencoe. Until you get here this innocent, slight placename won’t conjure up the might of it’s impact when you draw in it’s staggering beauty. Rannoch Moor does help to prepare you with it’s bleak, stark wide wilderness as it funnels you in – a prince pointing you towards the king. Reminding you that there is more. There is, always, more in Scotland. Glencoe. Perhaps even beauty is too slight a term to define this valley of purest geography . If you remain still enough you might hear the mountaintops groan on their weight to the sky. Wait and listen in the ocean of hillside. Try if you can, before you visit Scotland by car, to read about the 1692 massacre. Thirty nine members of the Macdonald clan were killed in Glencoe by the Campbells. The pathos of these murders lies in the cruel reply to hospitality. The Macdonalds had entertained the soldiering Campbells here for over a week before the orders were given to execute the clan as they slept in their beds. All is not fair in love and war. Remembering this sadness as you linger slowly through this amazing place will add to the poignancy and the majesty of it all. The heavy solidity of the moored mountains reflects the heavy weight of it’s history. There are opportunities along the way to walk into the bowels of this great valley – one of these is The Devil’s Staircase. A zig-zag slow, steep climb with worthwhile views all the way to the top. The 10 mile path continues to Kinlochleven from here as it is one of the last stages of the wonderful West Highland Way. Pass Fort William where in the height of summer lupins line Loch Linnhe, a purple-pinked frame to the moss glowing mountains across the lengthy sliver of water. Drive into Glen Nevis where the highest peak in Britain, the mighty Ben Nevis, rules it’s domain. This benevolent seeming beast is humble in structure – it’s squat, stubbed chunk belies it’s quiet powers. 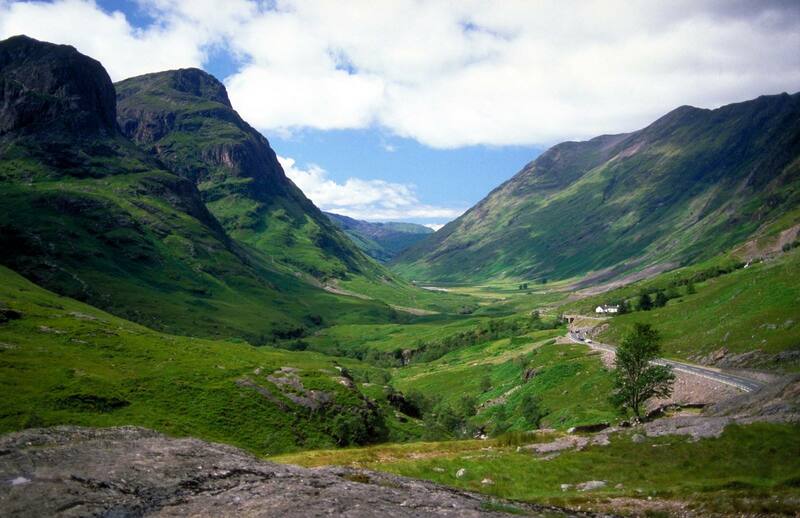 This Glen is famed for it’s alluring, beguiling beauty and has been used as a film location for epic productions such as Braveheart, Rob Roy and Harry Potter. Travel the length of this seductive glen to the end, park your car and then it is a short walk to where it theatrically opens up to an expansive gorge. The impressive Steall Falls increases the sensational effect, while you drink in the drama. Another epic, amazing place to visit in Scotland by car is Inverlochy Castle. This is just 3 miles from Fort William and is as superlative as the Highland landscape surrounding it. It is sumptuously embedded below the bulk of Ben Nevis and tucked into a corner overlooking it’s own private lake. When Queen Victoria visited here for a week in 1873 she wrote in her journal “ I never saw a more beautiful and romantic place” . Nod and agree with her. Stop here for an afternoon tea and feel the romance dripping onto your plates. 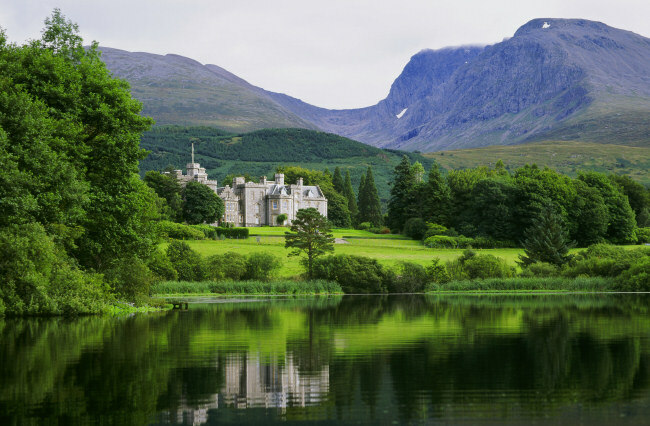 Inverlochy Castle Hotel oozes charming hospitality and it will serve you well to stop here. Head westwards at Invergarry towards the iconic Isle of Skye. This road journey will leave you with a wide grin as you bask in the loch filled vistas. Firstly Loch Garry, followed by Loch Loyne, Loch Cluanie and Loch Duich. When you have seen one you have not seen them all. Each one glides you expectantly onto the next. 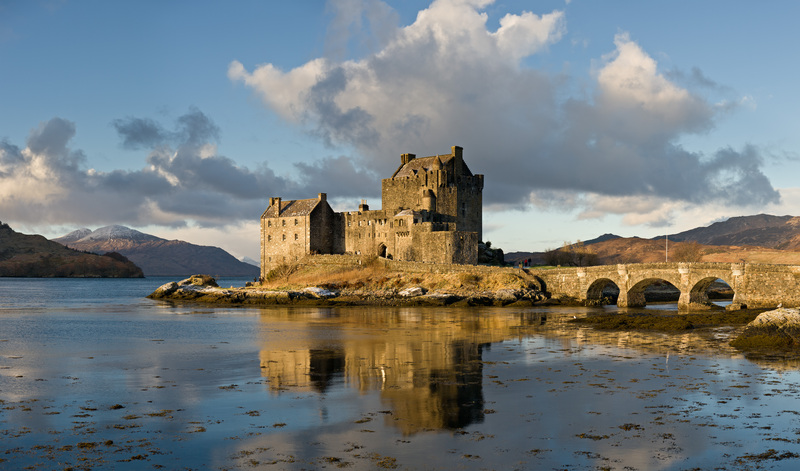 You will recognise the Eilean Donan Castle immediately from it’s much used image on calendars, magazines, t.v. and cinema screens. It is used widely because of it’s singular beauty. A three arched bridge leads your eye to the proud, haughty structure as the russet tipped seaweed floating beneath contrasts perfectly with the island’s grassy verge. With the hills and sea lochs stretching behind it , this 13th century castle is a perfect snapshot of an idyllic scene. Though this is real, solidly breathtaking and not a fantasy ideal. Step in and take a tour of this clan MacRae stronghold, view the internal rooms of this fabulous castle with period furniture, Jacobean artefacts, fine art and weapon displays. Breathe in the wideangled views and almost hear the swish of medieval kilts brush past you as this stalwart castle casts it’s spell. Expect more magic as you visit another amazing place in Scotland by car. Cross over the bridge to this Hebridean Hercules as it points outwards to the further reaches of Harris and Lewis. “Merry of Soul he sailed on a day over the sea to Skye. Billow and breeze, islands and seas, Mountains of rain and sun” – Robert Louis Stevenson knew the natural pulling power of The Isle of Skye as you soon will. Skye inherits it’s name from the old Norse sky-a which means cloud island and the central spine of the Cuillin Hills are often swallowed by the clouds. These sharp peaks mingle with moorland, lochs and rivers all spilling over with wildlife. The scenery is the natural first attraction here but Skye also displays it’s rich heritage and culture in various museums and historical buildings. On your drive around this island stop off in the southern tip at the Museums of the Isles at Armadale Castle. In the 6 galleries here you can explore the history of the Highlands and the Kingdom of the Isles in this ancestral home of Clan Donald. Enjoy the woodland walks and 40 acres of sheltered gardens allowing the Skye air to soothe the senses. Visit Dunvegan Castle home of the Clan Macleods encompassing 10 different building styles from 1200 to the 1800s. Imposing, edged between wooded rock and Loch Dunvegan, this Macleod bastion will transport you to another place with it’s rich historical castle collection. You can also be transported to the seal colony in the loch where you might also spot the regal heron nesting, arctic terns and sea eagles. This short boat journey will leave a long imprint as you lock in the image of the castle surrounded by blue and bejewelled islets. In the far north of the island at Kilmuir experience a slice of the soul of Skye with the crofting life depicted in the cottages of the late 1800s. Within these walls the oral traditions continued where the Hebridean songs and stories were inflamed by the peat fires. Explore the Barn, the Weaver’s Cottage, the Old Smithy and the Ceilidh House and perfectly reconstructed croft kitchens and bedrooms. grey-faced till the breaking of the sky.”(Sorley Maclean). One of Scotland’s most amazing places to visit by car is Loch Ness. The lore and lure of the monster has brought this long splinter of lake to worldwide attention but you will leave with the imprint of the magnificent stretch of beauty trumping the three humped legend. If you do catch an image of Nessie however that would be utterly memorable also…..and lucrative ! Visit the Loch Ness Centre and Exhibition at Drumnadrochit and get an indepth presentation of all things ‘Nessie ‘ as well as the geological history of the area. Take a cruise on the loch from here and imagine what lies beneath the depths. 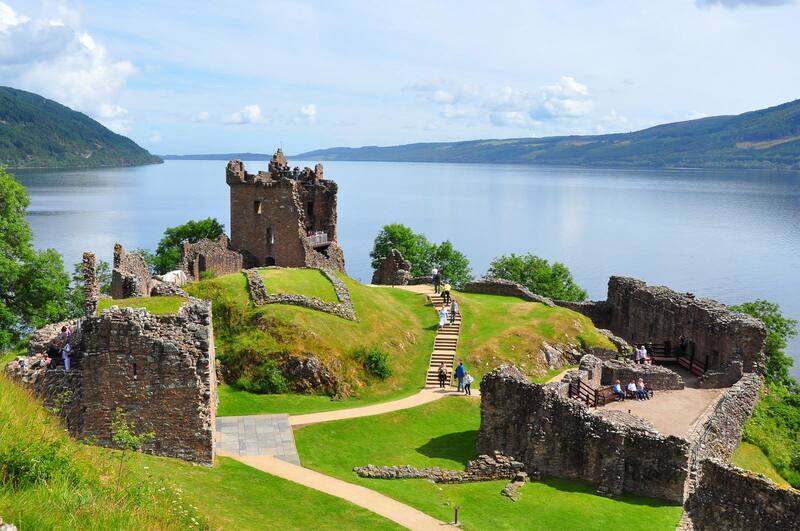 You will also see the ruins of Urquhart Castle from the water and this is also a magical place to visit by car. The ruins of this dramatic castle hold 1000 years of history within it’s crumbled walls. Climb the Tower drinking in the stunning stretch of Loch Ness and discover the darkened prison cell which may have held the renowned Gaelic bard Domhnall Donn. The exceptional artefacts at Urquhart Castle include a working trebuchet – a stone throwing siege engine. Through much of it’s history it fought to keep people from within the walls, this castle now has an embracing welcome for all visitors. Loch Ness will lead you to the capital of the Highlands – Inverness – meeting place of the River Ness and the Moray Firth. This compact city’s Old Town houses historical buildings such as the Cathedral and High Court with Inverness Castle grandly looming over the river. 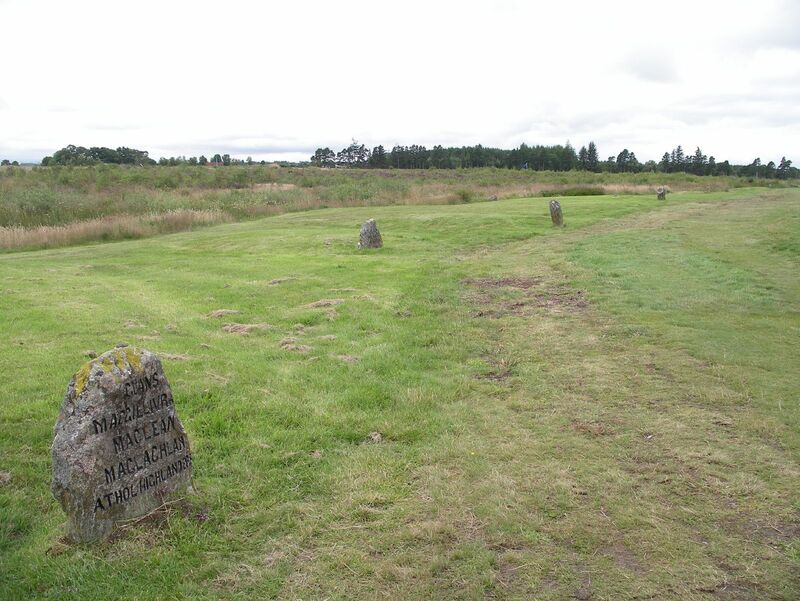 Less than 10 miles outside of Inverness you will come to the Culloden Battlefield. This is surely another amazing place in Scotland to visit by car. It is the site of the last pitched battle to be fought on British soil in April 1746. In just over an hour , over 1000 men had died in the short , bloody horror of battle. The visitor centre and interactive exhibition allows you to hear the original words in Scottish Gaelic of those who took part in the battle and events leading up to it, learn about those involved , watch a provocative film and take a battlefield tour with an audio device explaining the armies’ tactics. This last confrontation of the Jacobite uprising took place on a bleak open moor. It is easy to feel the desolation and despair of the battle here as you walk amongst the headstones. This was the flame which fuelled the decline of the Highland clans and closed the chapter on a civil war for the title of the throne. Time now to head further south and pull yourself out of the memories of the moor with a cheery dram or two. 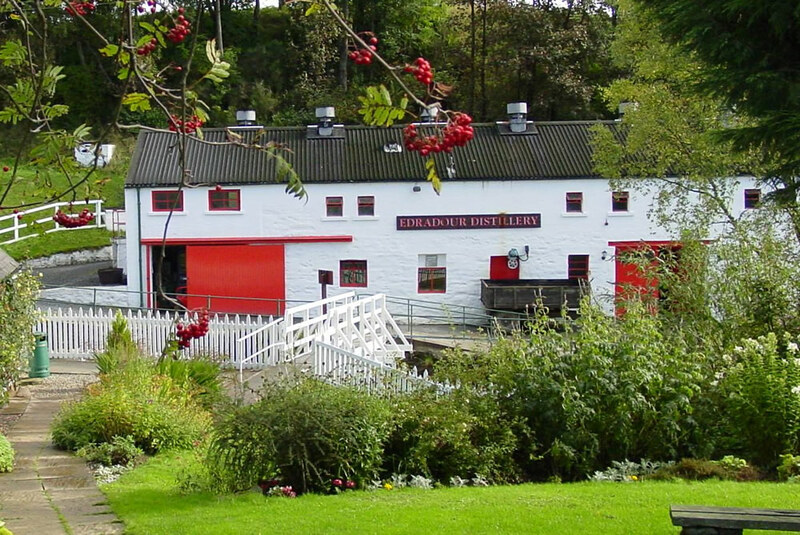 Visit the Edradour and Blair Atholl Distilleries by charming Pitlochry and taste the whiskys produced by both. Edradour is the smallest traditional distillery , dating from 1825 and is the last surviving single malt whisky produced from a farm distillery. Contrast and compare the whisky originating at the Blair Atholl Distillery. The water from the Allt Dour burn (small river/ large stream) is used to make the 12 year old single malt whisky with a deep aroma and fruity flavour. Complete your distillery tour with a smooth finish in the rich tones of Pitlochry’s Fonab Castle’s loch-side lounge bar where you might like to sample one of their signatory gin cocktails or continue with your whisky tasting. A chauffeur driver/guide is the best option for today’s testing route or spend the night in Fonab Castle Hotel to taste the luxury here. It’s a short drive back to Edinburgh to drop off your car, full of appreciation for all the amazing places you have visited. Scotland is almost mythical in it’s beauty, perhaps the eighth wonder in the natural world. The fresh, rugged clarity of this weather moulded land hastens you to return, nae, long to be here.